Lord Oberon has taken a day of love and twisted it into something cruel and sinister. Two events unfold that see man turn on man and great champions rise through the ranks. 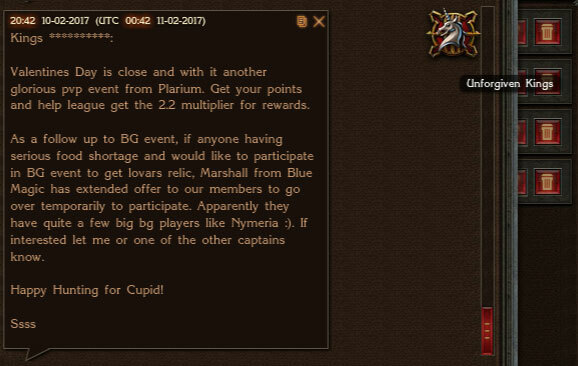 Another grand tournament was announced for all of the realm to partake in. Lord Oberon himself made the declaration, much to the delight of his citizens. Preparations were quickly made, as a limited window for the event would be allotted. 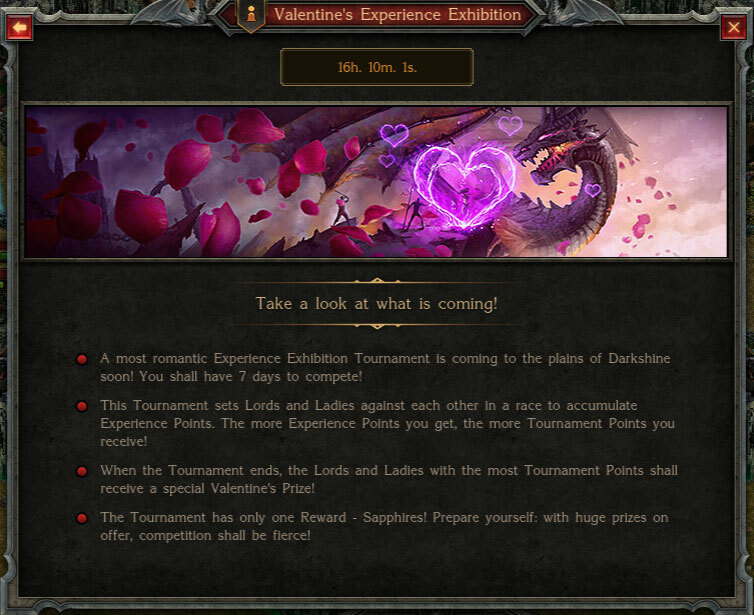 The tournament of which I speak of is none other than the Valentine’s Day events, where both a PvP and Experience event were unveiled. Both of these events helped usher in the day of "love," which is rather ironic given that it was greatly steeped in bloodshed, death and destruction: a cruel joke of Lord Oberon's, no doubt. Leagues all over the realm encouraged their members to take part in the chaos and even planned co-ordinated efforts in which their members could be included. As the events unfolded and the action took place, it was very clear that there was going to be a few individuals who dominated the charts and who many others would have a difficult time catching up to as the hours dwindled down. 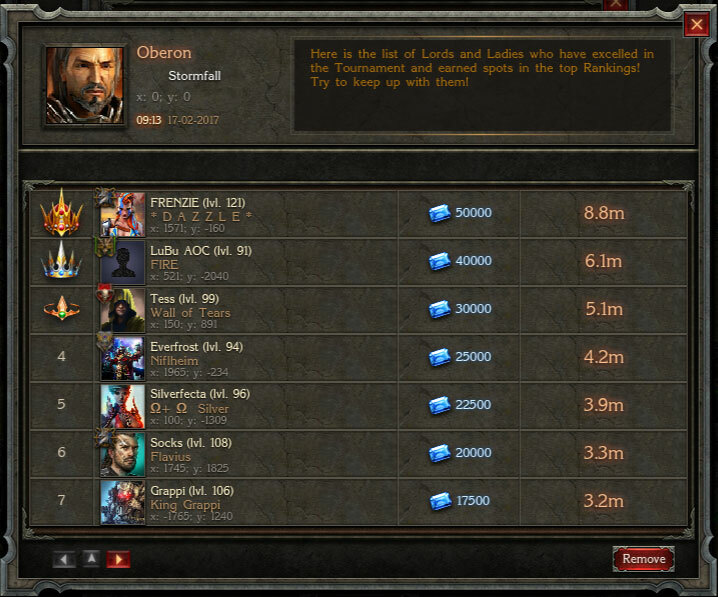 Some faces are very familiar to veterans of the realm, such as Frenzie, who was leading the pack by a great margin. Tess, Grappi, One4All and many others were also well represented. As you scrolled through the pages, many other new and lesser-known faces also appeared in the rankings, proving that this truly was an event for all. Finally, the dust settled and the carnage came to an end. 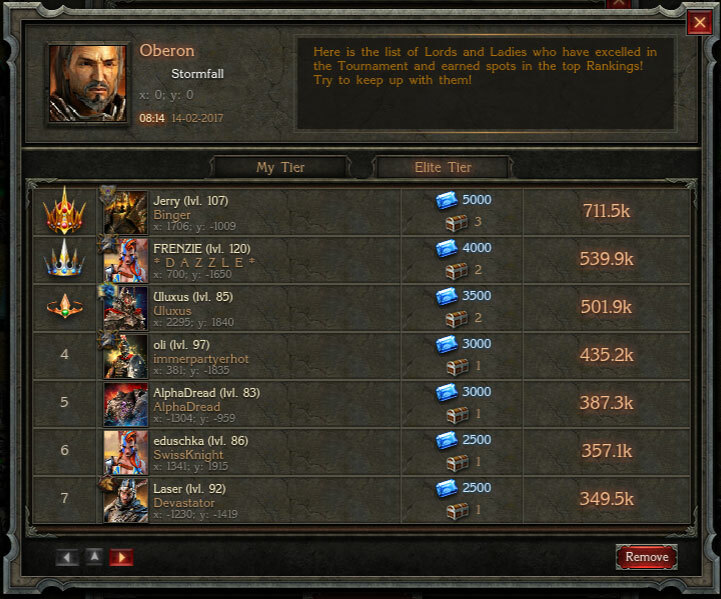 Lord Oberon announced to all the realm the winners of which both the PvP and Experience tournaments. Surprisingly, Jerry of the league Dominus was able to pull ahead of Frenzie, who had a stunning lead early on in the event, to take the first place position in the PvP tournament. Meanwhile, Frenzie held onto her title in the experience event and took in an amazingly high score of 8.8 million points! This is truly a stunning amount. Not to be overlooked, others, such as Uluxus, Oli, LuBu, Tess and Everfrost, also scored remarkably high scores and must be congratulated as well. With this, a grand event comes to a close, until the next time, which is surely just around the corner.